DS9DM, DS12DM, DS14DAL, DS14DL, DS14DMR, DS18DL, DS18DMR, DV14DMR, DV18DL, DV18DMR, G14DL, G14DMR, WH8DH, WH9DM, WH9DMR, WH9DM2, WH10DL WH12D, WH12DH, WH12DM, WH12DM2, WH12DMP1, WH12DMR, WH12H, WH14DL, WH14DM, WH14DMR, WH18DL, WH18DMR, WP12DM, WR8DH, WR9DM, WR9DMR, WR9DM2, WR12DH, WR12DM, WR12DMR, WR12DM2, WR14DL, WR14DM, WR14DMR, WR18DL, WR18DMR. 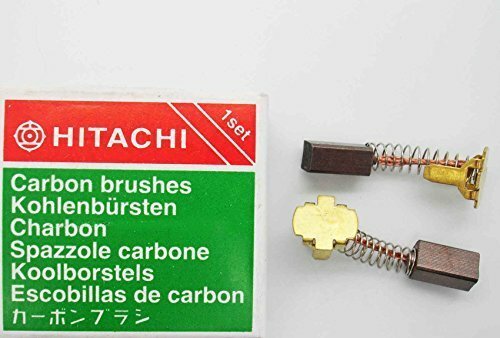 Carbon Brushes Hitachi 999054 14V 18V WR18DL WR14DL DS14DMR DS18DL DS18DMR H21. Carbon brushes Carbon for Hitachi C 9SA2 / C 9U / C 9U2 / CC 12SA / CC 14SA 14SB. Carbon brushes Carbon for Hitachi P 20SD P 40 P 50 P 50K P 50SA PDE-180 PG 21SA. Carbon brushes for Metabo Plane HO 8382, Paint thrower 714. Carbon brushes Carbon brushes for Hitachi BM60 BM35 DH45 DH50 DH55 DUPN2 H55. 20 Pcs Carbon Brushes Spring Loaded CB101 15.5 x 10 x 6mm for Makita. Carbon brushes compatible with Black Decker &DN - 710. Carbon brushes Carbon for Hitachi GP 13 GP13 G 18 G18 G 18DF G18DF G 18SC G18SC. Carbon brushes Carbon for Hitachi CC12SA-M CC16 CC16M HU12 HU14 999-038 7x13x17. Carbon Brushes for Bosch Angle Grinder PWS18-230J, PWS19, PWS20, PWS20-230J, PWS1900. Carbon brushes Carbon for Hitachi CC 12SA-M CC 16 CC16M HU 12 HU 14 12M 14M. Carbon brushes for Hitachi DH50SB / G18 / H55SC / H55SCK / C9 / C10.